You know that is going to be fabulous Tuesday evening, when Devin Townsend is on the menu. 14th of March and just before 7 pm people were already qeueing outside the Barrowland Ballroom in Glasgow. To make it all more colourful in the dim evening light there was local chap standing with his guitar and playing Devin’s songs. You cannot possibly miss the venue! Devin Townsend usually has very interesting supporting bands for his concerts and tours and this gig is no exception. Norwegian progressive metal band Leprous started their rather dark show at 7.30pm. It was only half an hour long but full of quality stuff and audience seemed to enjoy it. The next on stage – UK based TesseracT, who wiped everything in their way with the incredible energy. Guys prepared quite a performace and warmed up the crownd for the evening star. Just before getting on to the stage, Devin’s voice was already in the air, telling stories of all sorts and not letting people to wonder away. 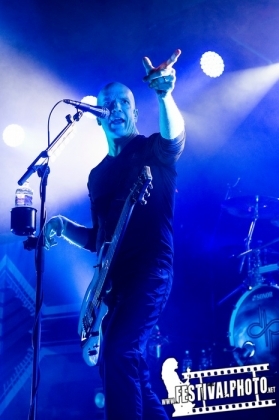 Once the whole Devin Townsend Project team showed up on the stage, the crowd went nuts. Although the venue was not sold out this time (as it happened the previous times), the crowd sincerely was enjoying the whole show, very responsive to Devin’s jokes, moshing and dancing to masterfully played music. Guys were moving towards the end of the 7 week long tour and Devin admitted that it affected him, when he was trying to entertain aucience with all the gear being completely turned off. Even with his bare voice and dance he managed to lead the crowd his way, listen to him and laugh at dance with Ziltoid puppet. The set included both old and brand new tracks, was well prepared and lasted for hour and a half corronated with lovely sing along ‘Ih-Ah’ and ‘Higher’ for the encore.